The actor: When Billy Bob Thornton first arrived in L.A., it was with an eye toward a career in music, but plans change. Not that he didn’t still end up with a music career, but Thornton’s first success came as an actor; and within a few years he’d also found success as a writer and director, earning tremendous acclaim for his 1996 film, Sling Blade, in which he also starred. Although Thornton has gradually phased directing out of his regular repertoire, his acting career is stronger than ever, thanks in no small part to his performance in season one of FX’s Fargo, and he can currently be seen starring in the new Amazon drama Goliath. A.V. Club: Having watched the first two episodes of Goliath before talking with you, it’s hard to imagine anyone getting to the end of the second episode and not wanting to immediately launch into the third. Billy Bob Thornton: Yeah, that’s a cliffhanger, that one! AVC: How did you find your way into the series? Did David E. Kelley approach you? BBT: Yeah, they just offered it to me. And it’s the kind of character that I’d wanted to play, actually. As most characters are that I play, there’s a lot of me in it, anyway. AVC: Certainly the first name. BBT: Yeah, that for sure. [Laughs.] That was kind of odd, because I’d hear my name all over the place, and it’d turn out that they’d just be having a meeting about a scene or something. 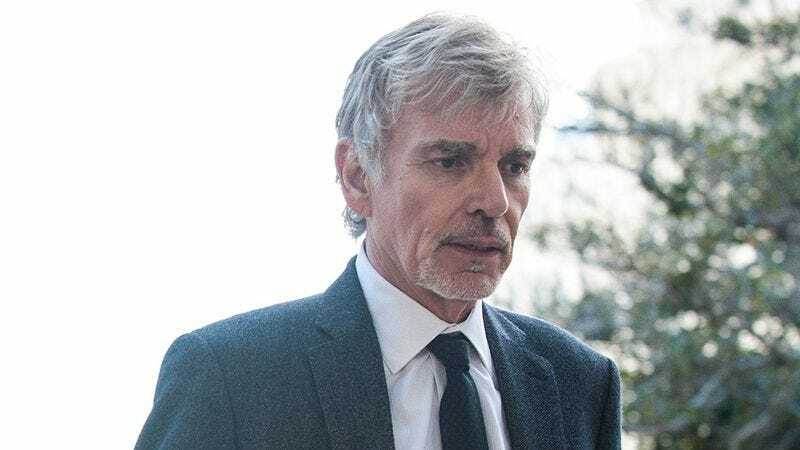 AVC: Watching Goliath, it seems like the opportunity to be away from a broadcast network has really proven freeing for David E. Kelley. BBT: Yeah, that’s the great thing about Amazon and Netflix and HBO, all those places. You can do what we used to do in independent film. Because the independent film business is pretty much gone. Now you can do it in a format where you actually get to develop a character over a period of time. I think I’ve said this before, but when we were doing Fargo, it really was like doing a 10-hour independent movie. So that’s what we’re trying to do here and, yeah, I guess for those guys it was kind of freeing to be able to use a curse word or two and that kind of thing, with no network people over them about that. AVC: How would you describe your character, Billy McBride? BBT: Well, he’s just a guy who used to be somebody and kind of blew it, and he’s trying to claw his way back. I think a lot of it is that he obviously needs to work to survive, but a lot of it also has to do with his own dignity. He wants something to do. He wants to feel relevant. And he ends up against a company that fired him. I think that’s probably everybody’s dream. [Laughs.] If you think you can win. And he’s the kind of guy who thinks he can! AVC: It feels like a story of redemption. BBT: Oh, absolutely. No question about it, yeah. And what’s really great about it is that we don’t shoot in L.A. much anymore. You know, TV and movies, most everything’s shot other places. And in this, L.A.’s a real character in the show, so we get to show America all this stuff about California that maybe they’ve forgotten. You have the [Santa Monica] pier and Chez Jay and Venice and the canals and downtown and all these things. We shot all over L.A., the valley included. So for me, on a personal level, it was great because I got to stay home with my family, but artistically it was cool, too, to show L.A. again like that. Because, even though it’s a contemporary thing, it gives it that L.A.-noir kind of feeling. AVC: I was actually going to say that it reminds me in a number of places of The Long Goodbye. BBT: Yeah, this guy… the thing about the character—he’s not just a lawyer. It’s almost like he has to be a private investigator and a lawyer all at the same time. There’s some Sam Spade and all that in there, too. It’s a lot like the characters that [Robert] Mitchum or [Humphrey] Bogart would play. AVC: It looks like your first on-camera role was playing a character named Billy Bob—a big surprise there—in a film called Hunter’s Blood. BBT: Oh, yeah. [Chuckles.] I don’t even remember what that was like, it was so long ago. I was a stand-in on that movie for the whole production, and then I was in, like, two scenes. And they didn’t know what else to call me, ’cause they just kind of threw me in there, so they had me keep my name! AVC: It looks suspiciously like a Deliverance rip-off. BBT: Yeah, I think that’s what it was: a cheap rip-off of Deliverance. I don’t think many people ever saw that one. AVC: I can’t claim that I have, either. BBT: Yeah, I wouldn’t worry about it. [Laughs.] I wouldn’t put it on your list! AVC: How did you find your way into acting in the first place? What led you down the path to make it a career? BBT: Well, I came out here just to continue playing in a band. Tom Epperson was coming to L.A. to become a writer, and he said, “You ought to go with me!” So I came out here, and I kind of found out that you don’t just come out here and get in a band in L.A., but we met this one guy who had a contact with this other guy that… Tom knew his girlfriend’s mother back home. [Laughs.] And he was in an acting class, and he said, “Hey, you ought to come to my acting class and try that!” And everything kind of started from there. I got a theater group, and casting directors started seeing me doing one-act plays, and I used to do a one-man show and stuff like that. So that’s kind of how it happened. I started getting roles, I started to have a little bit of money, and I just kind of went with what was happening. AVC: As far as your music career goes, it looks like your first actual recording credit was on Neil Young’s soundtrack to Dead Man. And that’s not even music. It’s just dialogue from one of the scenes. BBT: Yeah, I didn’t record anything when I first got out to L.A. In fact, before that, the last time I’d recorded was in about ’78 or ’79 in Ardent Studios, in Memphis, with my band back there. And the first time I recorded was in Muscle Shoals, Alabama, but that was never released. That was just my local band. We went down there to make a 45, which… I think one of those guys still has that on reel-to-reel tape! But, no, the next time I recorded anything with my own music was… the late ’90s? Somewhere around there. Because the acting thing just kind of took over for a long time. AVC: Yeah, your first solo album, Private Radio, came out in 2001. BBT: Yeah, that was the first actual album on a real label. That was on Lost Highway. It’s a Universal label. That was great. Robert Hilburn really liked that album, and that was a big thing to me, because I’d always read his reviews and articles. That was huge to me. And then about 10 years ago, we started The Boxmasters after I’d done four solo albums. The last solo album I did was Beautiful Door, and J.D. Andrews was doing some assistant-engineering on it. Somebody asked me to record a song for something, and he played guitar on it. So we recorded this thing together, and we really liked the sound. We did two stylized albums where we used old hillbilly stuff mixed with the British Invasion, and then we did another one where it was more along the lines of Big Star and late-’60s stuff like The Byrds, The Flying Burrito Brothers, and that kind of thing. These days, people say we fall into the category of being sort of Tom Petty And The Heartbreakers-ish. But we just got off tour a couple of weeks ago, and it was probably our best tour ever. We’ve gained a lot of new fans, and we’ve built up a real cult following. So I’m real satisfied. AVC: You opened up for the Steve Miller Band, right? BBT: Right. Not on this last tour, though. But we’ve opened for Steve Miller and ZZ Top. We’ve opened for ZZ before over the years. Also, Elvis Costello, Heart, and different people. We kind of like that role, opening for people that we admire and people we listened to growing up. That’s always a great thing. It also gets us in front of bigger audiences. That’s always something that appeals to us. AVC: On the topic of people you admire, is there a particular memory that stands out for you about your friendship with Warren Zevon? BBT: Oh, every moment with Warren stands out. [Laughs.] He was a real character, Warren. I loved him. He and I didn’t meet through the entertainment business. We were neighbors in an apartment complex in West Hollywood. That’s how we met. I was a working actor and writer by then, but I wasn’t by any means a household name. So when we met, I knew who he was—he didn’t know who I was. I was just a guy who lived in the apartment building. We met because he discovered that I have OCD, which he had, and we started talking about that. He saw the way I was getting my mail out of the mailbox, which was… quite complicated. [Laughs.] And he said, “Oh, so you’ve got it, too, huh?” “Yep, I do.” So that’s how our friendship started. AVC: You did a nice version of “The Wind” on his tribute album. BBT: Yeah, he made some of The Wind at my studio. I used to own Slash’s old house. I bought my house from Slash in Beverly Hills, so it was the old Snakepit studio there. I was there for 13 years—we moved recently—but Warren recorded “Knockin’ On Heaven’s Door” there and parts of some of the other songs. I did some background vocals on two or three songs. AVC: That’s such a great album, but it’s still a rough album to listen to even now. BBT: Oh, yeah, I hear you. Yeah, it was really something else. I went to do background vocals on one session over at Sunset Sound, and I got there and Jim Keltner was on drums. Ry Cooder and Warren and Jorge Calderón were there… I mean, it really was something else. AVC: You had a decidedly more substantial role in One False Move, not just in terms of your screen time, but in that you also co-wrote the film. BBT: Right, yeah. That was really a turning point, because… it didn’t make me a household name, but it got us—me as an actor, Tom Epperson and I as writers—a name within the business, and it was really great. Roger Ebert was a big fan of that movie, and it was on some of the top-10 lists of the year and stuff. So, yeah, that was a real turning point, that movie. AVC: How was your relationship with Carl Franklin on the film, given that he was directing your words? BBT: Oh, it was great. Carl’s a real actor’s director, you know. I really like Carl. I still talk to him once in a blue moon. And Ben Myron and Jessie Beaton, the producers, I still talk to them once in awhile. Yeah, it was a really good experience. And Carl’s a terrific director. I’d like to see more out of him. AVC: You were in FX’s Fargo, but prior to doing the series, you had a more direct connection to the Coen brothers, starting with The Man Who Wasn’t There. BBT: Yeah, they had known me for quite a while. We had a mutual friend, a producer friend. The first time I met them was at a Super Bowl party at his house. He used to have a Super Bowl party every year. So years before I worked with them, I knew them. You know, they get around to it. They know who they want for things, so you can’t hurry them up. They know when it’s right. So I did The Man Who Wasn’t There with them. I also did the movie Intolerable Cruelty with them, and they were also executive producers of the first Bad Santa. They’re terrific. I mean, it’s hard to beat them. I like them and Sam Raimi and… I’m just thinking of directors I’ve worked with that I’ve really enjoyed working with. Barry Levinson, who did Bandits. Marc Forster, Monster’s Ball. Yeah, I’ve been really fortunate to work with some great directors. AVC: When you started directing yourself, were you making any effort to emulate anyone in particular, or were you just forging your own path? BBT: Well, you know, I… [Hesitates.] Not really. I sort of just did what came naturally to me. I’d say if anybody influenced me at all in terms of when I first started—I mean, the first thing I did was a documentary on Widespread Panic [Live From The Georgia Theatre]. But I’d say if anyone influenced me at all out of directors who were working at the time, maybe Jim Jarmusch a little bit? And then I put him in Sling Blade. [Laughs.] He’s actually in that. But I always liked his stuff. Down By Law was one of my favorites. AVC: And you actually got to work for him on Dead Man. BBT: Yeah, I barely even remember that. It’s funny as you get older. Someone asked me one time if I’d worked with Jarmusch, and I said, “Yeah, he was in Sling Blade.” And then they said, “Well, didn’t you do that movie with him?” And I’d almost forgotten that. [Laughs.] But, yeah, I did. AVC: How do you look back at Sling Blade, given that it was your first big film? Do you look back and just see the mistakes, or do you still have significant pride in it? BBT: That’s one we made pretty much the way we wanted to make it. I don’t think I’d change a thing in that one. I’m not really a guy who wants to be a director, anyway. I’ve just done the things that I—well, I was asked to do All The Pretty Horses by other people, so I wasn’t as in charge on that one. And then I made a couple of other small movies—Daddy And Them and Jayne Mansfield’s Car—that nobody ever saw. You know, I’m really influenced by Southern novelists, not many movie people. More like John Faulkner, William Faulkner, Erskine Caldwell, Flannery O’Connor, John Steinbeck, and people like that. AVC: Well, for what it’s worth, Ron White can’t say enough good things about Jayne Mansfield’s Car. BBT: Yeah, we really loved that movie. But like I said, these days there’s not much of an independent film business. You’ve got a distributor who kind of throws it out there and nobody really sees it, and a few bloggers say bad things about it ’cause you didn’t sign their poster one time or whatever it was. I don’t know what happens. But the movie wasn’t given a chance. On the other hand, it came out on all these top-10 lists of the most underrated movies of the year that didn’t get a fair shake. AVC: It seems like there’s still a win in there somewhere. BBT: Absolutely. And, you know, five or 10 years from now, people will see it on TV, and I think they’ll love it. Because it’s no different than anything I’ve ever done. Same vibe, you know? It’s just that you’re at the mercy of people these days, and if you do a movie that’s outside the box… That used to be a good thing, but now the idea in the movie world is to make things the same. And in the TV world, the idea is to do something different, so… that’s why I’m here! [Laughs.] It’s tough these days. I’m not sure that I’m really relevant as a director anymore. Or as a writer, either, to tell you the truth. I think my stuff’s kind of obsolete now, you know? I’m making Model Ts or something, and everybody else is making spaceships. AVC: Yeah, but at the same time, anybody can theoretically see the work you’re making if it’s available for streaming, and that includes the audience that specifically likes Model Ts. AVC: When Fargo first premiered, viewers didn’t really know what to expect. It shared a name with the Coens’ film, but it wasn’t a continuation of the film. What were your thoughts when it was pitched to you? BBT: Well, I was offered the part, and I read the pilot script and said, “Who wouldn’t do this?” Seriously! I called my manager and said, “Who in their right mind wouldn’t do this?” But first off, I wanted to make sure Joel and Ethan were okay with it. But they’d signed off on it, so that was enough for me. And I really liked [creator-producer] Noah [Hawley] and [producer] Warren Littlefield and all those guys. It was just so well written that I loved the character. There was no reason not to do it, you know? And like I said, it felt like making a 10-hour independent film. It was a really great experience. Those don’t come along very often. AVC: So did the experience of doing Fargo open you up to considering more TV work? BBT: Oh, yeah. But I think everybody’s contemplating TV now, because mid-level and high-budget independent films are not being made now. So if you’re going to take care of your kids and pay for your house and do something good for adults, you have to do something on television now. Because the great movies that I want to do now are being made for $2.5-million budgets. The great scripts that you read now for adults—and by “adults,” I don’t mean for dinosaurs or somebody who only likes Bette Davis, I mean for people who love movies who are 36 years old or whatever. So, yeah, it’s really hard. But on television you can do it. And I think actors are all looking at that now as a great alternative, whereas when I was coming up, if you were on a TV show, that meant something was wrong with your career. Now it means something’s right with your career. AVC: You had done TV before this, of course. In fact, Fargo isn’t even your first time doing a series inspired by a film: You were also in Fox’s series version of The Outsiders. BBT: That’s right! And I had a great experience on The Outsiders. You know, I was just coming up, so I didn’t have a lot to compare it to, but that was also Fox. The Fox network was a baby. It was, like, their second year or something. And one of my most vivid memories from that show is playing the Fox Stars versus the Rock Stars in a celebrity softball game. [Laughs.] So it was, like, me and David Arquette, Ed O’Neill, and Christina Applegate, and we were playing against people like Ozzy Osbourne and Vince Neil for charity! But that show was great to do. I had a great time on it. AVC: Oh, there’s another TV role that particularly stood out: How did you end up doing a guest voice on CatDog? BBT: [Laughs.] That was… I dunno, I was just a big fan of it, and I think I’d met some of those people at the network, so they just said, “Yeah, you should do a voice on CatDog!” So they brought me in there to play CatDog’s stepfather, who was a frog. It was a lot of fun. I think I just did the one or two episodes, though. AVC: You also got to do the voice of a character named Hound Dog McDog. BBT: Oh, yeah, that’s right! [Laughs.] I forgot that! Yeah, I’ve done a little bit of that stuff. You know, voice-overs for animation. I did Princess Mononoke when they put it into English language, and I did Puss In Boots. I did an episode of King Of The Hill and an episode of American Dad. I actually did Robot Chicken, too, which was fun. I really like Seth [Green]. He’s a funny guy. BBT: Oh, God, that’s really something I barely remember. My friend Valerie Breiman, she wrote and directed that, and she and I had done stuff in the theater together. And she said, “Hey, could you come down and heckle Adam Sandler at a comedy club? I’m making a movie.” So, yeah, that was essentially it: I just went down to the comedy club, sat down in the audience, and said some stuff to him. [Laughs.] That was a long time ago! AVC: Was that the first time you met Peter Berg? Or was he even in that scene? BBT: You know, I don’t even remember that. It was certainly well before Friday Night Lights, but I don’t remember meeting Pete then. But like I said, that was a long time ago, a lot of water under the bridge. I just remember Valerie and Adam, and that Adam’s character was named after Shecky Greene. That’s about it. AVC: You mentioned Bad Santa a few minutes ago. When you did the original film, did you always envision the possibility of a sequel at some point ? BBT: Yeah, I mean, we didn’t really think about it while we were making it, but afterwards. It’s the kind of movie that kind of begs for a sequel, you know? And we figured we’d do it someday. But there was a lot of red tape over the years, because the studio was sold to a bigger studio. And then Disney, I don’t think they were going to make a movie like that. [Laughs.] And then the new Miramax started back, so it was just a long time waiting for all the right stuff to be all straightened out, and then a few years of waiting for the right script. We had two or three different ones that we were working off of, and finally we were satisfied with what we had. But, yeah, I saw it, and I think it’s really good. You know, critics are hard on sequels a lot of times, so we’ll see. But in terms of the movie itself, I think it comes real close to the first one. AVC: The first film was actually the last time you worked with John Ritter. BBT: Yeah. [Sighs.] Yeah, that was. John was one of my best buddies. He was a great guy, and I had the good fortune to work with him on TV years ago [on Hearts Afire]. And then Sling Blade, of course, I put him in there. And then he did such a good job in Bad Santa. [Laughs.] He and Bernie [Mac] both are terrific in it. In this one, we’ve got Kathy Bates along, and I hadn’t worked with Kathy since Primary Colors in ’98, but I’ve known Kathy over the years and always loved her, so it was a real pleasure to work with her again. AVC: Speaking of Primary Colors, there’s a film that’s still highly relevant at the moment. BBT: Oh, yeah. [Laughs.] No doubt! AVC: What was that experience like, knowing full well that you were paralleling a real-life situation? BBT: Yeah, that was something else. [Laughs.] I mean, when you’re doing something like that, you want to try to be respectful and yet do the piece justice. You know, I was playing a character I guess kind of based on [James] Carville, but I didn’t want to imitate him. I wanted to play a guy like that, not do an exact imitation of him. Hopefully I got that done. AVC: Did you hear from him after the fact?